and some of the successful candidates. The first candidates have successfully completed the new DHF Powered Gate Safety Diploma training course. This is the latest initiative by the Door & Hardware Federation (DHF) in its drive to increase safety levels of powered automatic gates. Twenty installers were put through their paces during the intensive two-day course held in Manchester at the beginning of September. 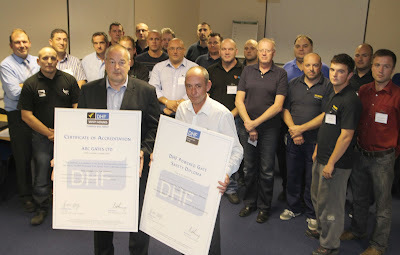 They completed a number of training modules, covering all aspects of gate safety from initial risk assessment through to force testing, in order to obtain their coveted DHF Gate Safety Diplomas. The DHF Gate Safety Diploma opens a new chapter in powered gate safety in the UK. The training curriculum was developed following consultation with the Health & Safety Executive and is the industry's only scheme to offer this depth of training. “The Gate Safety Diploma course sets a new standard in gate safety. There is no other safety assured training scheme for gate safety like it in the UK and it will quickly become a benchmark. The course is open to installers and all personnel responsible for assessment and inspection of powered gates. The second diploma course is being held in October and further courses will be held early in 2014. For more information on the DHF Gate Safety Diploma scheme visit www.dhfpoweredgategroup.co.uk .